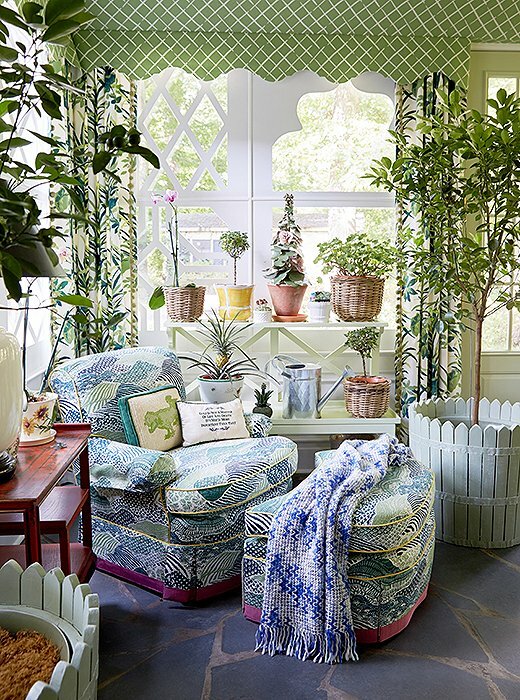 This gorgeous sunroom is from designers John Loecke and Jason Oliver Nixon's charming 1930s Regency Revival home in High Point, North Carolina. The first thing in the room that catches my eye is the lovely geometric tent; it creates a bit of drama, whimsy and visual interest in the room without losing any valuable floor space. The focal point in this room is definitely the cheerful and comfortable floral sofa. A group of pretty decorative pillows further enhance the comfy, cozy feeling in the space. A variety of seating and multiple side tables provide plenty of options for both the homeowners and guests and they are especially useful when it comes to entertaining. The addition of plants and trees conjures a half indoors and half outdoors feel, creating a more special and inviting environment. Bright, beautiful and cheery, what's not to love about this fabulous space? 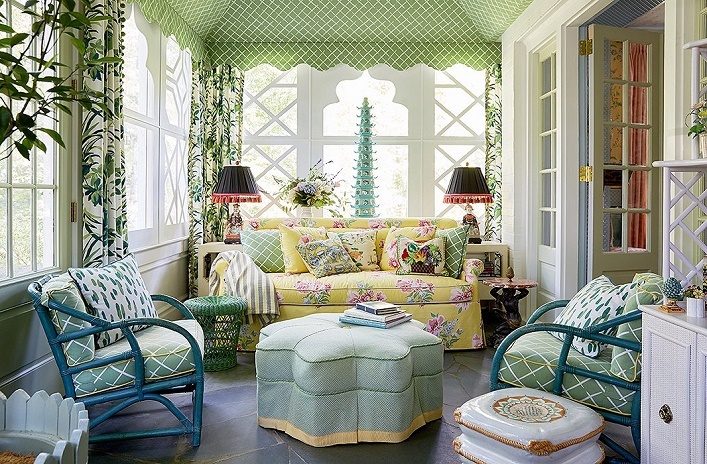 The designers' knack for layering patterns and cheery colors is especially admirable, don't you think? Are you drawn to this fabulous sunroom as much as I do or do you find the design a tad too busy for your taste? I would love to know your thoughts!